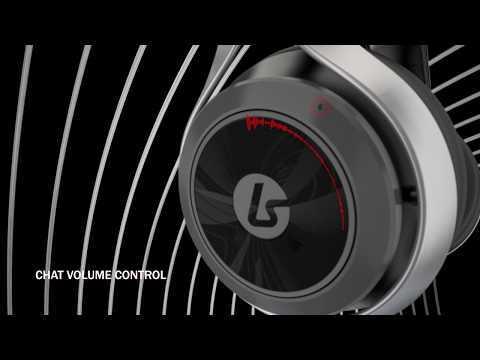 Introducing the most radically designed gaming headset, the wireless LS30 by LucidSound. Breaking the molds of traditional gaming headsets, the LS30 not only looks elegant but is functionally different than any other gaming headset. The LS30's revolutionary design provides simplistic, intuitive controls to adjust the most commonly used features including game volume, game mute, chat volume, and mic mute. With both an integrated microphone and removable boom microphone, the LS30 can be used on the go with any mobile phone or audio device. The versatility and cross platform compatibility allows the LS30 to work seamlessly with the XBOX One and PS4 as well as legacy consoles including the XBOX360 and PS3. Not all gaming headsets are created equal but most follow the same design language of being super techy and clumsy looking. LucidSound set out to design the LS30 for the human race rather than an alien or a cyborg. Who cares how you look in the living room? We do. Most wireless gaming headsets have one similar issue they all share, controllability. Typical wireless gaming headsets are frustrating when hunting for the right button or rocker switch just to hit the wrong one mid-game. The LS30 offers the most intuitive control scheme ever in a gaming headset. Each earcup has an elegant integrated control wheel and center button for simple and easy-to-find controls. We designed the LS30 headset frame so that your hands can easily find and control the most frequently used features effortlessly. Comfort is a key element of a gaming headset that may be worn for hours at a time. The LS30 was designed to be comfortable for most every size head, big or small. Tension is just enough to keep the LS30 snug without crushing your skull. Memory foam ear cushions mold to your ears reducing ear fatigue. LucidSound is an audio company, and even though sound is an individual preference, we strive to provide the most balanced high performance audio experience possible. Wireless: Advanced uncompressed wireless technology provides the best possible sound quality. Rechargeable Battery: The built-in battery delivers 15-hours per charge. Independant Game and Chat Volume controls: Adjust game and chat volume independently so every game detail and communication comes through loud and clear. Crystal Clear Communication: Use the flexible boom mic for intense gaming or remove it and use the integrated mic for mobile use. Built in mic monitoring: Built in mic monitoring lets you hear your own voice so you don't shout. 50mm Speakers: 50mm speakers with Neodymium magnets provide deep bass and clear highs. EQ Modes: Choose the sound that's right for you or the game you're playing with 3 unique EQ presets. *Depending on which Xbox One Controller is used, the Xbox One stereo headset adapter may be required and sold separately. Requires Xbox 360 with Optical Port.